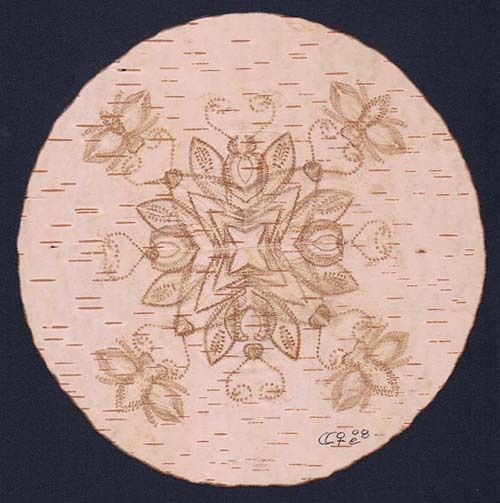 Birch Bark Biting is one of the oldest First Nations art forms. It Is done by separating pieces of birch bark and folding it two or more times. You place the bark between your teeth visualizing what you want to create. You begin biting while rotating it with your hand. Originally, birch bark biting was a form of competition to see who would create the most elaborate design. Later they were also used for beadwork and silk embroidery patterns. There are more than 10 stages to complete just one piece. It has been said that the best designs were used to create the Chief's regalia (elaborate traditional clothing) and that each bite represented a spirit. Birch bark bitings were also used in as part of the construction of certain sacred ceremonial object.